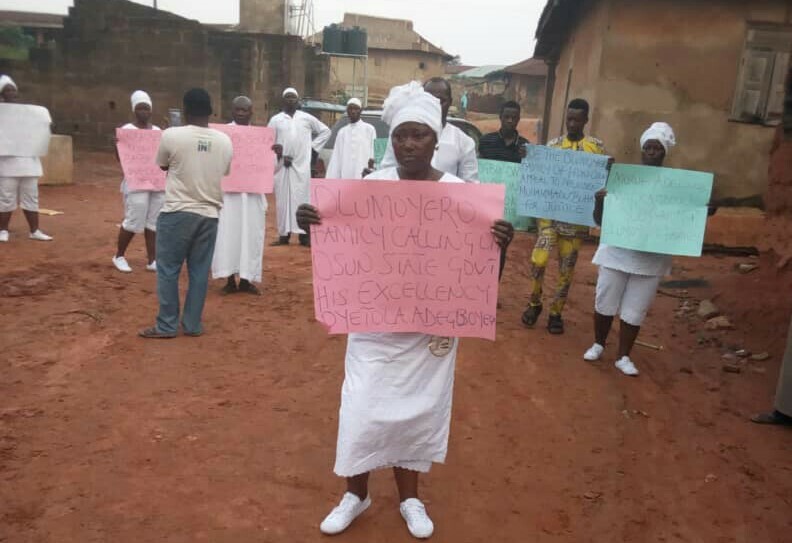 Protesters from Olumoyero ruling house in Ifon-osun,Osun state on Saturday took to the street to express their grievances on what they described as illegal ascendancy of the throne by the incumbent traditional ruler, Oba Moruf Adekunle magbagbeola. They unanimously denounced the monarch who claimed to have come from their ruling house before he occupied the throne saying ,the claim was not true, as they called for probe of such claim. The protesters, who were all in white attires, started the procession as early as 7.00 P.M from the centre of epicentre of the ancient town. 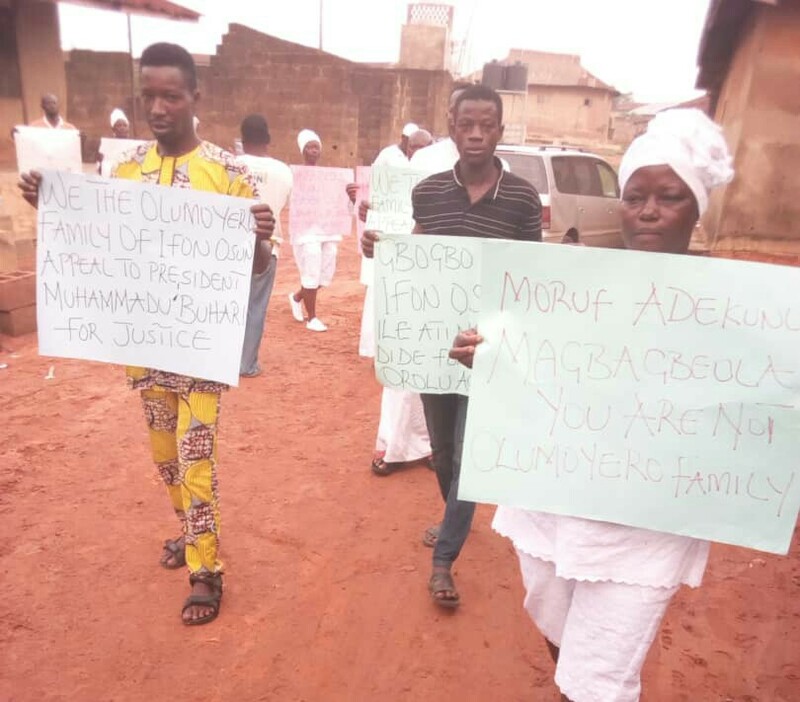 Armed with placards with different inscriptions that read:”Moruf Adekunle magbagbeola,you are not from olumoyero ruling family”, “You are not qualify to occupy the seat”, among others. The spokesperson of the protesters, who was identified as head of the family, Prince Akintola kolawole called on the monarch to vacate the seat without delay, adding that he was not qualified to ascend the throne in the name of Olumoyero ruling house in the first place. 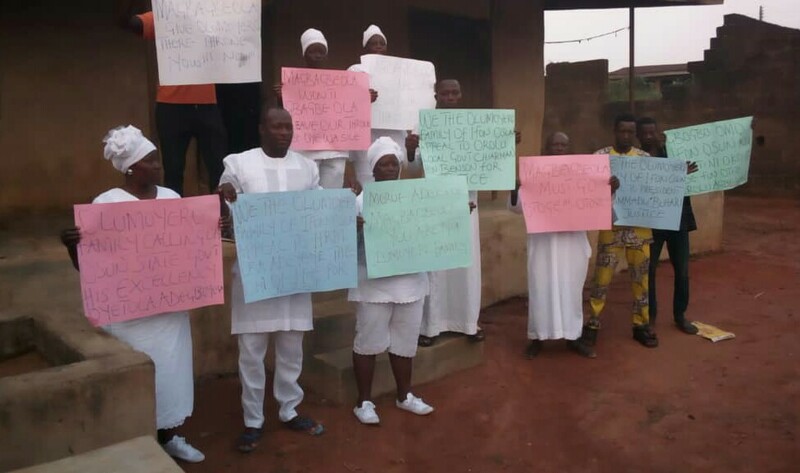 In his reaction, the traditional ruler dismissed their claims which he said it was not true. He stated that, he was even the secretary of the ruling house before he occupied the throne and that he would react extensively at the appropriate time.